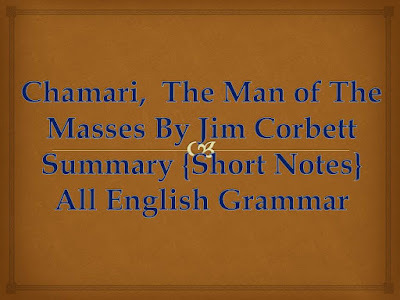 Jim Corbett Was an English Man. He was a famous hunter. during the British rule he spent many years in Bengal and Uttar Pradesh. He shot dead many man-eating tigers and saved the people and their cattle. In Bengal he worked as a contractor for loading and unloading coal from rail engines. He employed many men and women. He treated them well. Chamari was his accountant. Chamari was hard working. His accounts were perfect even to the last pie. Every Sunday he used to pay the wages to the workers. The wages were high when compared to the wages given in railways. All the workers were happy. When Chamari came to that area, he was poor. He joined the service of Jim Corbett for fifteen rupees a month. Jim gradually increased his salary to forty rupees. Years rolled on. Jim was away for some time to take part in the war. He returned to Bengal after the war. One summer cholera broke out throughout Bangal. The workers of Jim also were affected by the disease. Chamari served them by turns. After a few days, he too, suffered from cholera. Jim went to see him. The condition of Chamari turned serious. He could not recover. He died in the presence of Jim. All sections of the workers attended his funeral. Jim was deeply indebted to him. he lost a sincere, selfless and industrious worker.